Raptor Services, LLC is a Wisconsin based consulting firm providing comprehensive data required for private and public agencies during the permitting and mitigation process required for land development. For the past 14 years, Raptor Services has been providing services for a variety of projects associated with highways, bridges, pipelines, transmission lines, wind farms, landfills and residential developments. We provide surveys on nearly all avian species, with additional expertise regarding raptor concerns. Nest searches for many species of birds. Aerial searches for eagle nests. 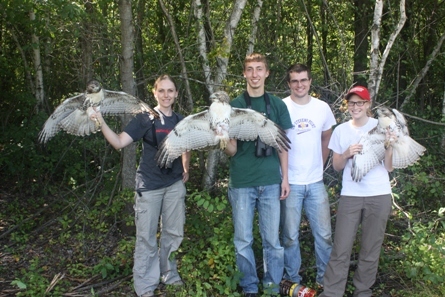 Broadcast call surveys for Red-shouldered Hawks and Northern Goshawks. Documenting eagle and hawk nesting behavior during construction period. Osprey nest surveys for along pipelines. Nest verification for song birds using micro-video cameras. A long-term case study on the impact of highway construction on nesting Red-shouldered Hawks. Relocation of raptors causing safety concerns at airports. Migration counts at major flyways along the shorelines of Lake Michigan and Green Bay. Breeding Bird surveys (part of a nation-wide annual count). Christmas Bird counts (part of a nation-wide annual count). View a list of our peer-reviewed publications here. Please contact me at your earliest convenience to ensure maximum flexibility in scheduling.